As previously shown in an older post, here is my Tillering Stick that I made on the right. Further below you can see the tiller in use when tillering my new longbow that I have been making. The longbow in question is my own design, borrowing elements from the ergonomic handles of recurve risers, but using two pieces of ash for the limbs. The handle is laminated oak. See my previous post about carving my longbow's handle. The tillering string used below is 3 pieces of sisal that I braided together. The same braided sisal was later cut shorter to make the bowstring. Before staining my bow I took it out to the garage and got in some practice with it. I shot about 10 rounds (4 arrows per round) with it and got some impressive accuracy with it. I wasn't expecting it to be quite so good (or maybe its me who is good). Whatever. I could have laminated backing on to the bow to make it thicker (and up the poundage) but I am happy with the results of my first working longbow so I think I will leave laminated versions for another date. During the staining process I opted for Red Mahogany polyurethane (the same stain I used when making my homemade crossbow). 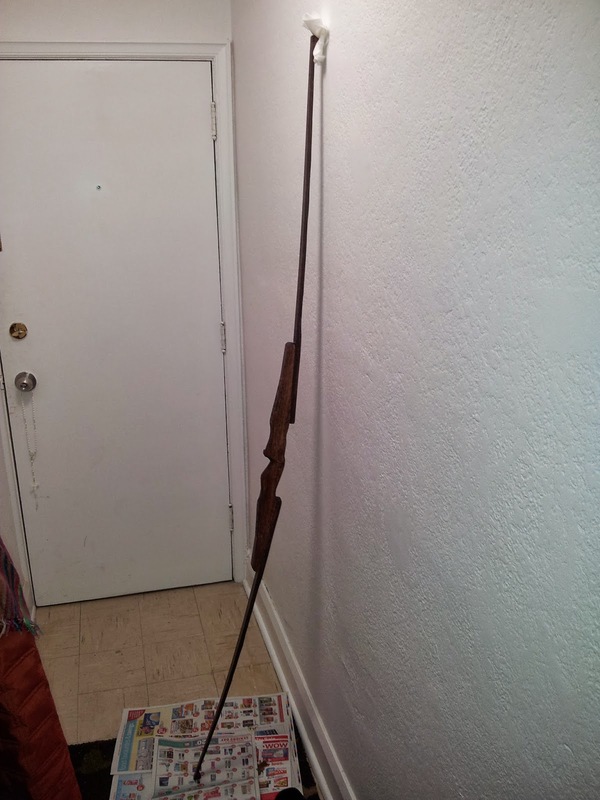 Below you can see the longbow drying in the hallway after the staining process. I may need to dry it for a fair length of time (2 or 3 days) judging by how long it took my crossbow to dry last time. I have lots of leftover ash and oak wood if anyone wants a custom made longbow. 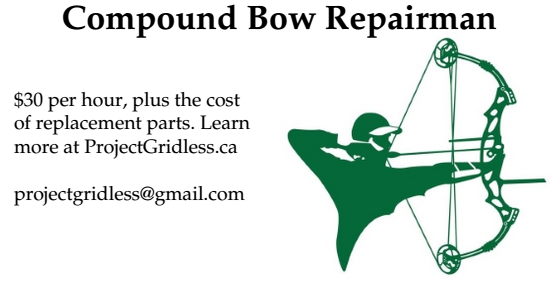 I would love to put my skills to the test making longbows for anyone who wants to buy one. Otherwise I will just use it for my own bow making and continue to better my skills. I am currently researching how to make fibreglass laminated wooden recurves bows. 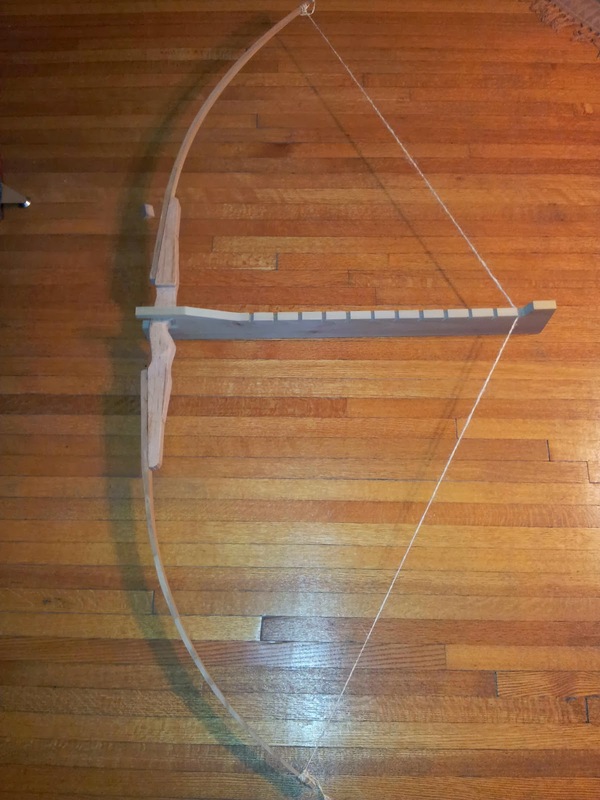 That will be my next big challenge, but my next project is actually to make a bigger and more powerful crossbow than my previous prototype design.